Illustrator Jaime Jones studied at the Corcoran College of Art and has worked for companies like Arenanet, and currently Bungie, as well as doing freelance work for Wizards of the Coast, Image Comics, Alderac Entertainment and others. Jones works primarily digitally and his online galleries are divided into sections like Digital Paintings, Digital Sketches and Old Work and includes a section of drawings and sketches in Traditional Media. In his primary Digital Painting galleries you’ll find a nice crisp approach to digital rendering; that often carries a feeling of painterly brushstrokes and spattered textures. His background renderings are often atmospheric; with enough suggestions of detail to ground them in tactile reality without weighing them down. 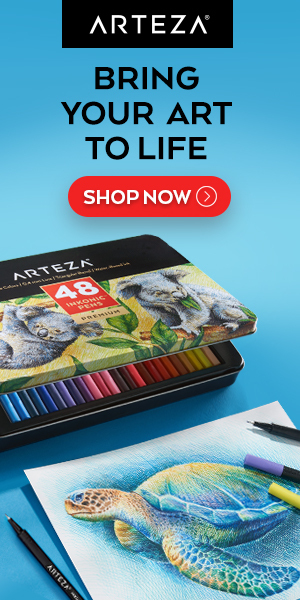 As often seems to be the case with digital artists, some of the most interesting images are in the section for digital sketches including studies after Bouguereau, Corot, Degas and Alma-Tadema. There is a brief interview on Irene Gallo’s blog, The Art Department as well as an additional gallery of Jone’s work on the Tor.com site. Long time readers of Lines and Colors will know that I have a particular fondness for painters at the edges of French Impressionism, both in terms of precursors to the Impressionist style and a range of other painters who were influenced by that style but took it in somewhat different directions, most notably the painters who are labeled “American Impressionists”. Over the weekend I had the opportunity to take in a new exhibition at The Newark Museum in New Jersey that showcases works in all three categories. Paths to Impressionism, French and American Landscape Paintings from the Worcester Art Museum opens with one of Monet’s paintings of waterlillies and features paintings from Impressionist precursors in the Barbizon School and other early exponents of en plein air landscape painting, like Camile Corot, Charles-FranÃ§ois Daubigny, Constant Troyon, Julien Dupre, Eugene Boudin (who was directly influential on Claude Monet) and Georges Michel, who was one of the first French landscape painters to make a regular practice of painting on location. The show then moves into American painters influenced by the Barbizon school, like Joseph H. Greenwood, Jervis McEntee, John Francis Murphy and Dwight Williem Tyron. A highlight is a series of stunning small landscapes (and a few larger ones) by George Inness, who grew up in Newark and later settled in nearby Montclair, New Jersey. As you progress through the exhibit it then presents you with a few paintings by French Impressionists, notably Alfred Sisley and Camille Pissarro (also here); and it moves into a gallery of American Impressionist painters for a grand finale that includes a number of striking paintings by Childe Hassam, a beautiful Sargent landscape and a small jewel by Luther Van Gorden. It’s a beautiful show, and while not large by blockbuster museum exhibit standards, is complete enough within itself to give a very nice overview of the influences leading to and away from the nexus of artistic styles known as Impressionism. The exhibit is nicely complimented by another exhibit at the Newark Museum called Small by Sublime: Intimate Views by Durand, Bierstadt and Inness, featuring works from the Hudson River School and Tonalist movement in the U.S; and for those like me who are visiting the Newark Museum for the first time, can be supplemented with a number of pieces to be found in the permanent collection, including landscapes by Childe Hassam and one of my favorites by Pennsylvania Impressionist Daniel Garber. Paths to Impressionism was organized by the Worcester Art Museum in Massachusetts in 2004, and traveled to The Allentown Art Museum in Pennsylvania and the Frist Center for the Visual Arts in Nashville, Tennessee, and possibly other regional museums, before it’s current run in Newark (the page devoted to the exhibition on the Worcester Art Museum site is not up-to-date with the exhibition’s schedule). I don’t know where, if anywhere, it goes from here. Paths to Impressionism, French and American Landscape Paintings from the Worcester Art Museum is at the Newark Museum until January 4, 2009. There is a catalog accompanying the exhibiton. 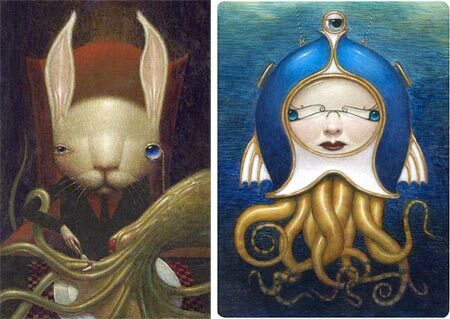 Bill Carman has an approach that combines stylish exaggeration, line, painted rendering, texture, design and a variety of applications of color to achieve an entertaining and eye-catching range of illustrations, paintings and drawings. Carman studied at De Anze College and Brigham Young University and is currently a professor of illustration and drawing at Boise State University. In addition to his work for clients like Lucas Arts Entertainment, TSR, Opera Idaho, Ford Aerospace, UTNE Reader, and a number of other editorial and commercial accounts, his work has been featured in publications like the Society of Illustrators Annuals, American Illustration and the Spectrum collections of contemporary fantastic art. He is the author and illustrator of the children’s book What’s That Noise?, from random House. The gallery on his own site is essentially just a shopping cart for giclee prints; of more interest is the wider range of work shown on his gallery on Boise State University, which is divided into sections like illustration, children’s books, paint stuff and draw stuff. I particularly like the pieces in the painted stuff section. Don’t miss the Altoids icon at the bottom of the pop-up that leads to a selection of painted Altoid tins, and the sketchbook link to the right of that. There are also larger images of some of his paintings in the Tor.com gallery. When I discovered Erin Kelso’s work on conceptart.org, I did my usual dig to see what else I could find about the artist, who was listed only as “bluefooted”. I eventually found out that she also has a presence on deviantART, where she is also listed only as “bluefooted”, but no actual website or blog. I eventually contacted her, found that she does have an actual name, and that she a PhD in evolutionary biology andÂ a Master’s in zoology and is working for a university; and her art is done in her off hours. Kelso is largely self taught as an artist (though I think I saw in a post that she is taking a class of some kind currently), and takes her inspiration from numerous sources. 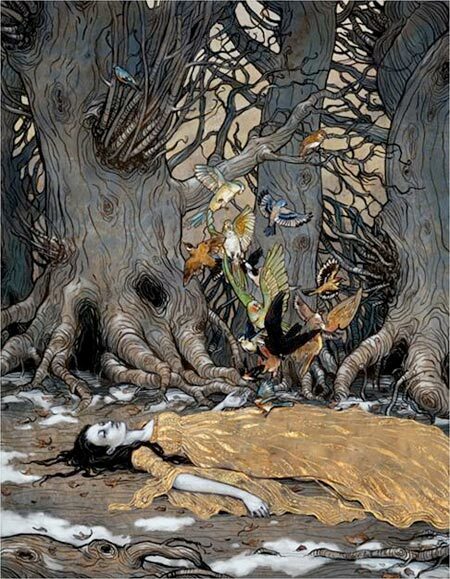 When I contacted her, she confirmed my thoughts that she was influenced by artists like Arthur Rackham, Edmund Dulac, Gustav Tenggren and Gustave Klimpt; and mentioned contemporary artists like James Jean, Jon Foster, Yoshitaka Amano, Michael Kaluta in addition. It is the strong design elements and artful use of texture that make her work particularly appealing for me. I also enjoy the pen and ink and watercolor approach that carries some of the flavor of both drawing and painting; and her nice combination of Rackham-inspired line work with areas of Klimpt-like textures and patterns. Peder Mork Mønsted was a Danish painter active in the late 19th and early 20th Century. Looking through his work you will find lush, color saturated paintings of his native Denmark, where Mønstead studied at the Copenhagen Academy, as well as landscapes from lands where he traveled, including Norway, Sweden, Switzerland, North Africa and Italy. 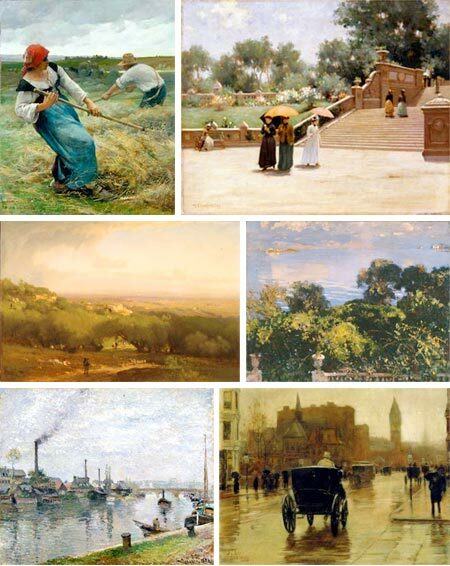 His paintings ring with a crisp, vibrant naturalism, emphasized by passages of sharp detail and strong value contrasts. The detail doesn’t keep them from being painterly, and lively with the feeling of the artist’s hand. His subjects ranged from shade darkened streams, dappled with sunlight, to snow covered Nordic fields and the warm sun of the Italian coast. Mønsted’s fascination with water and small streams remind me of Norwegian painter Frits Thaulow (also here). 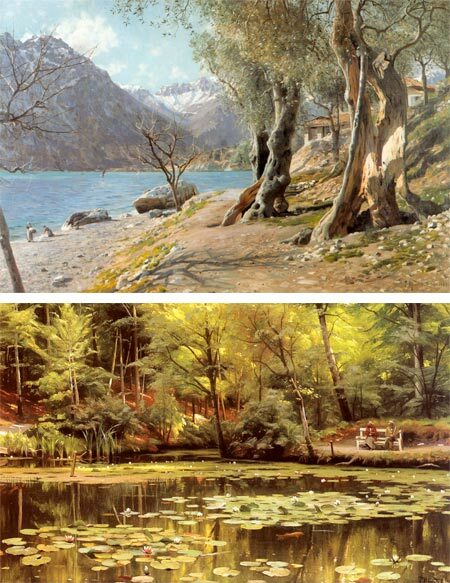 Overall Mønsted’s style is a wonderful blend of intense, almost impressionistic color with strong academic underpinnings. 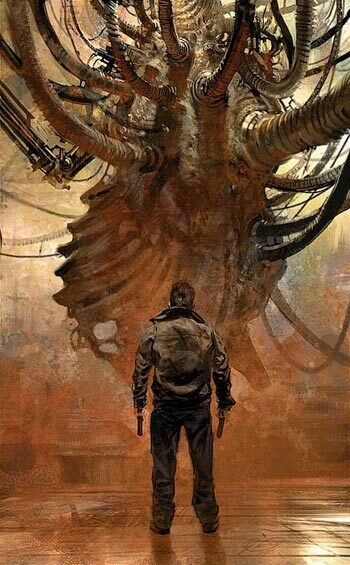 Hethe Srodawa is an entertainment industry concept artist currently working for Rockstar Games. Like many in his field, Srodawa paints digitally in Photoshop. 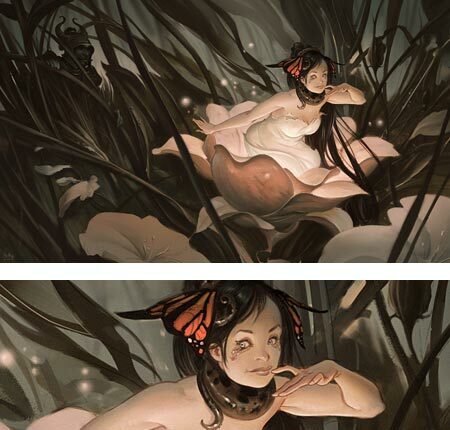 I came across his work, specifically the image above, “Enchanted“, on the CGSociety site. He also has a web site in which the portfolio is pretty much as informal as the blog, a mix of drawings, painted sketches and more finished works. His drawings and painted sketches have a nice, comfortable looseness about them, and his more finished works carry some of that forward at times with a feeling of gestural fluidity and brusquely applied textures.